Agfa Healthcare announced that it has received 510(k) clearance from the U.S. Food and Drug Administration (FDA) for its DR 800 multipurpose digital imaging system. The DR 800 handles a full range of radiography and fluoroscopy examinations. This modality is configurable, combining positioning freedom, workflow improvements, and high image quality, according to the company. The system includes Dynamic MUSICA image processing software as a standard feature for both static and dynamic image. Dynamic MUSICA enhances noise suppression, offers excellent rightness control, reduces veiling glare, and has capabilities which enable potential radiation dose reduction. The DR 800 is designed to enhance both efficiency and patient satisfaction with new workflow improvements and versatile positioning. It has a 180 cm source-to-image-distance. It can be equipped with high-frequency fluoroscopy generator options of 50, 65 or 80 kW, a console for patient-side positioning, a wireless console for remote control, a compressor cone, and an auto-switching anti-scatter grid. EasyStitch™ technology enables fast and high precision Full Leg Full Spine exams, while LiveVision™ technology allows for dose-free remote positioning. Use of Cesium Iodide (CsI) detector technology combined with MUSICA image processing offers high-speed, high-resolution imaging and enables the potential for dose reduction. 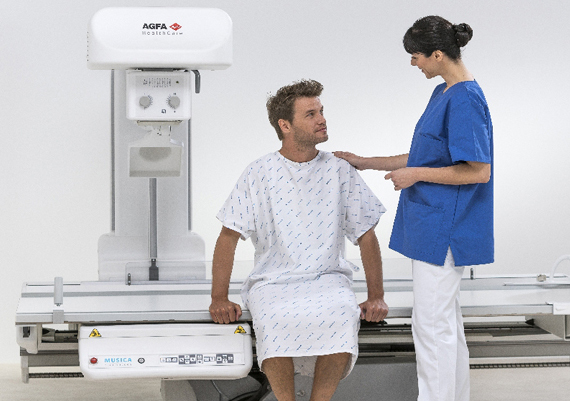 FDA clears Agfa digital radiography/fluoroscopy system. Appl Radiol.